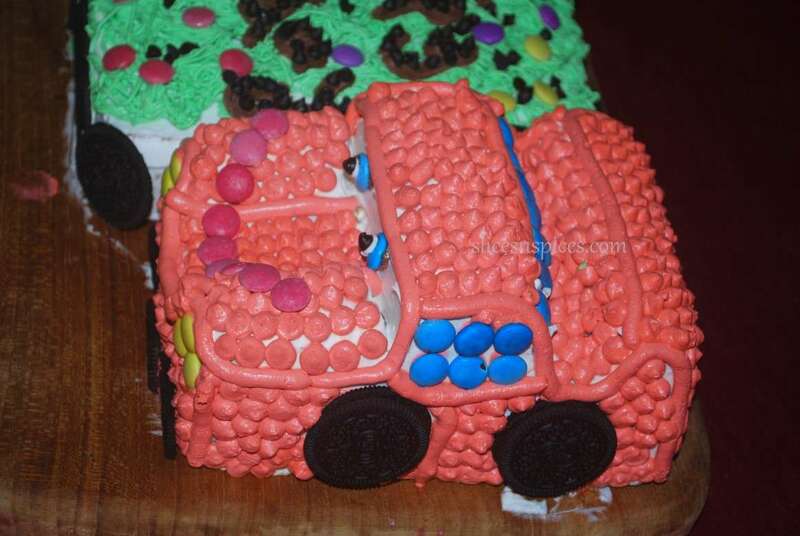 Celebratory cakes, planning a home made cake for special occasions, kids’ party cakes, lightening mcqueen cake, minion cake, simple birthday cakes, jungle theme cake,tips to make frosted cakes at home. 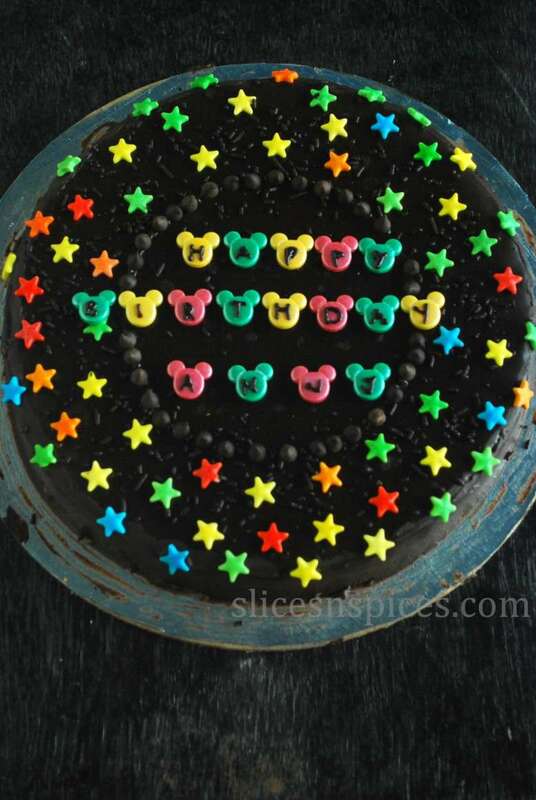 Two years of Slices‘n Spices and its celebration time on blog! This write-up was long over due on blog – a post to showcase some of my recent celebration cakes done for kids. From a complete non-organiser to a micro planner, a non baker to a hobby baker, a mechanical routine to a creative space, this blog has transformed my life in more ways than one. As I look back and reflect up on this journey, I guess the biggest reason I got into baking was this – to bake something which may not have the sleekness of bakery cakes, but the warmth of my hands and the sweetness of my affection for my loved ones to celebrate their special occasions. I decided my 2nd year blog anniversary post will be a non-recipe post, just penning down my experience of this beautiful journey, punctuated with some homemade celebratory cakes. As I always mention, kids’ cakes have to be at least planned 2-3 months in advance, preparation starts weeks ahead and changes made days ahead. The preparation starts with asking them their preferences and ordering the required stuff online. All along the way major and minor changes are made. 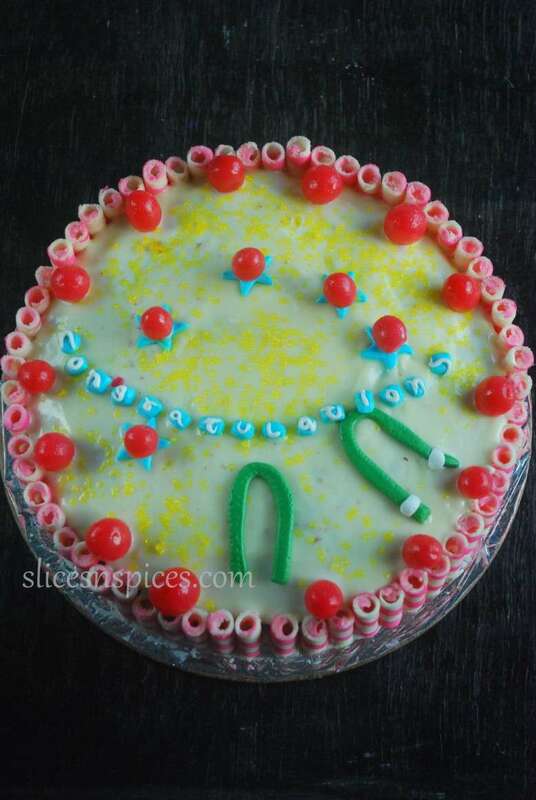 There was this Lightening Mc Queen craze going on for quite a while at home, and that was when my elder son Adi decided that mom could as well bake a Mc Queen cake for him. 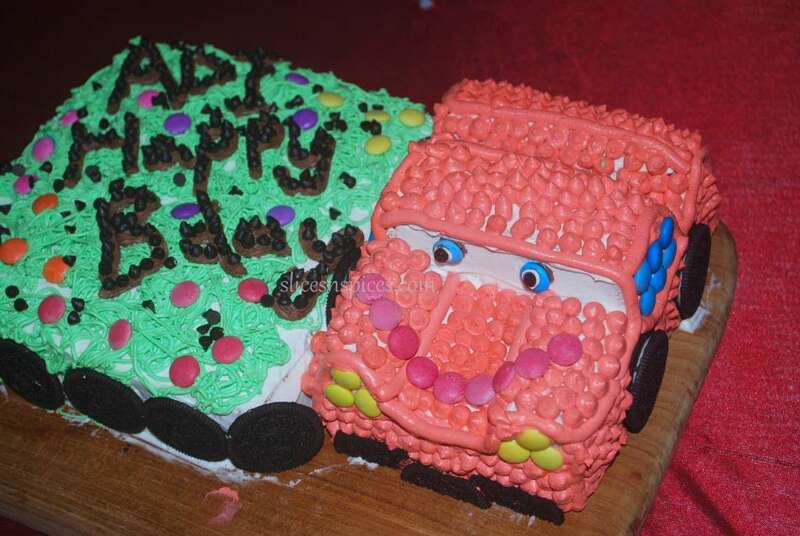 I was too tempted to order a car shaped cake pan for this one, but hubby said when you can easily carve one with a square cake, then why not give it a shot? 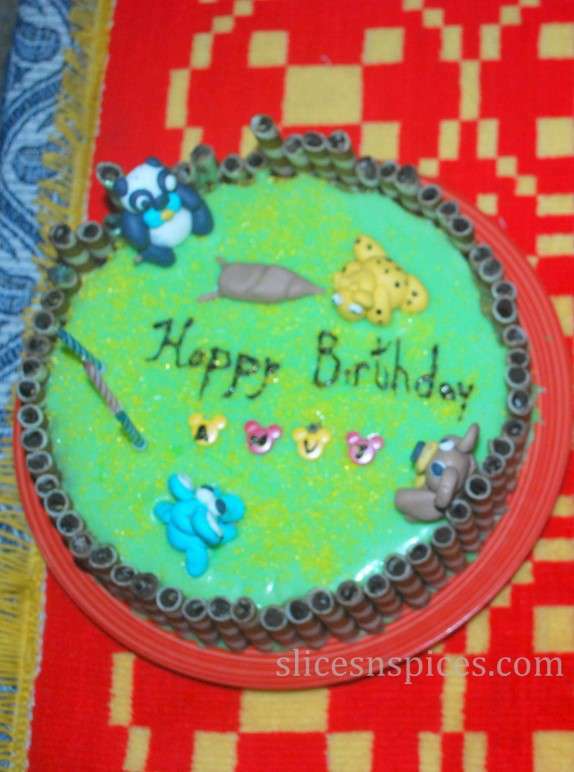 I searched for some online tutorials, settled on this one by Veena art of cakes, and tried to follow it to the T. I didn’t get the dimesions right, but after seeing the cake when my younger son squealed with joy ‘jhooth bole kawwa kate’, ( a sort of jingle which usually comes just before the start of the cartoon in its hindi version), I was relieved that my hours of hardwork resembled their favourite car ! And since the car needs a parking space, I decided to do a sort of garden, which unfortunately became too high for the car to climb on! So the two cakes were placed side-by- side. The cakes were vanilla cake with nutella buttercream filling and coloured whipped cream frosting. I had to convince kids that deep red would require me to add lots and lots or colour, and they reluctantly settled for this shade . 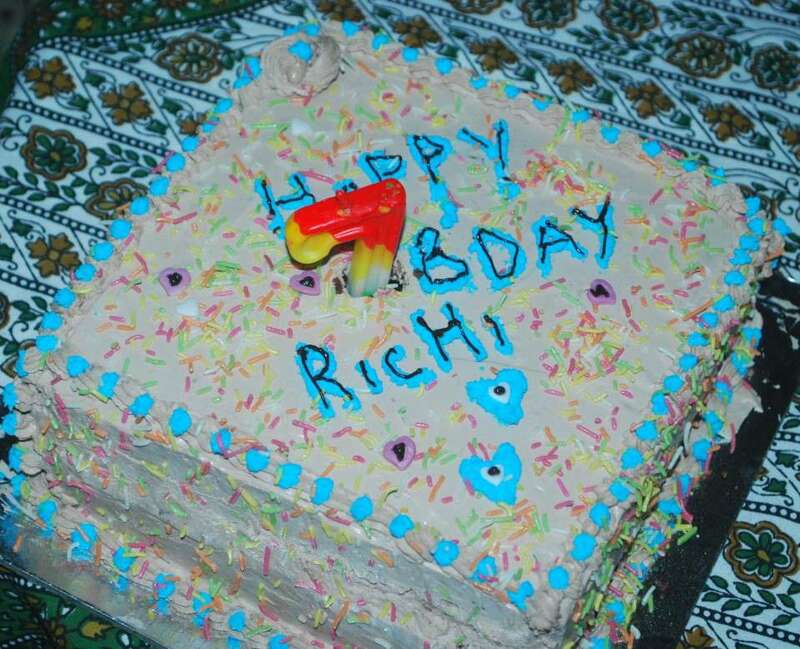 When your kids demand for more customised cakes, the scene changes entirely. It was time for my younger son’s birthday and I tell you this little fellow is not far behind his bother in imagining, especially when he knows his mom is at his disposal. 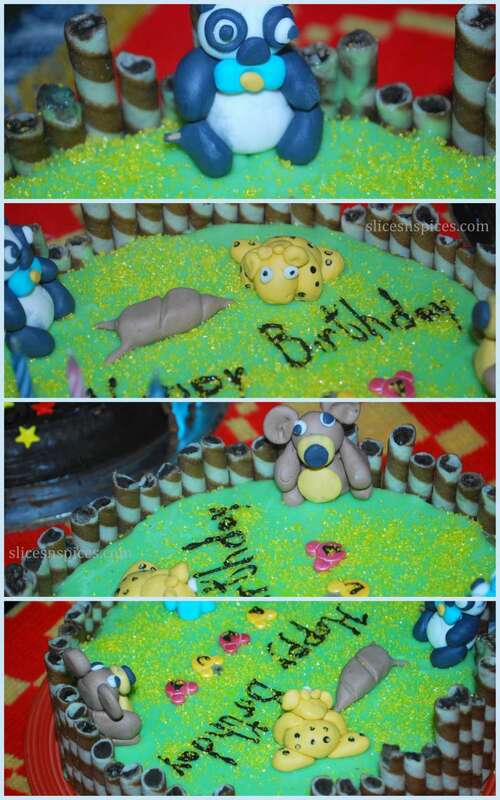 When asked, he said he wanted a panda, lion, giraffe, mouse and many other animals sitting on his birthday cake. I had to take my decorating skills to another level by venturing into the much dreaded world of fondant decorations. For beginners, fondant is a sugar paste made of icing sugar, glycerine . It’s like modelling clay, only more pliable. You can cover the entire cake with fondant to give a clean finished look to cake . 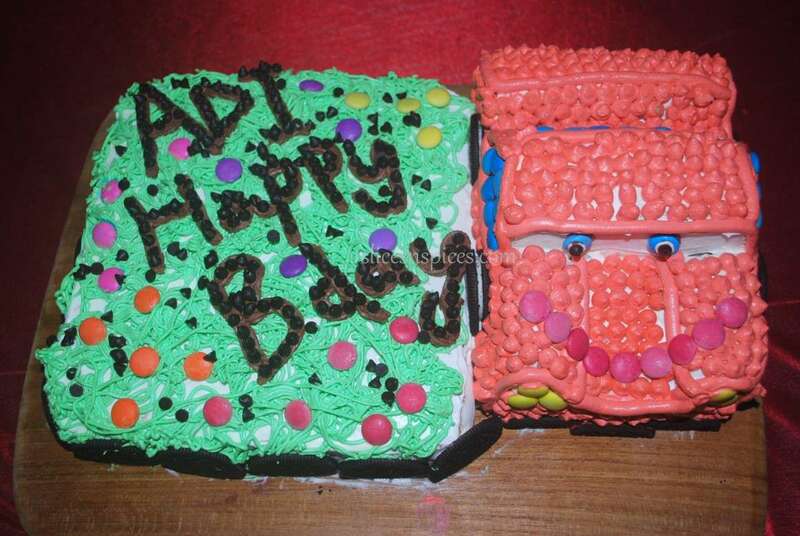 or you can make small figures from flowers to fruits or animals or anthing to make your cake more customised. 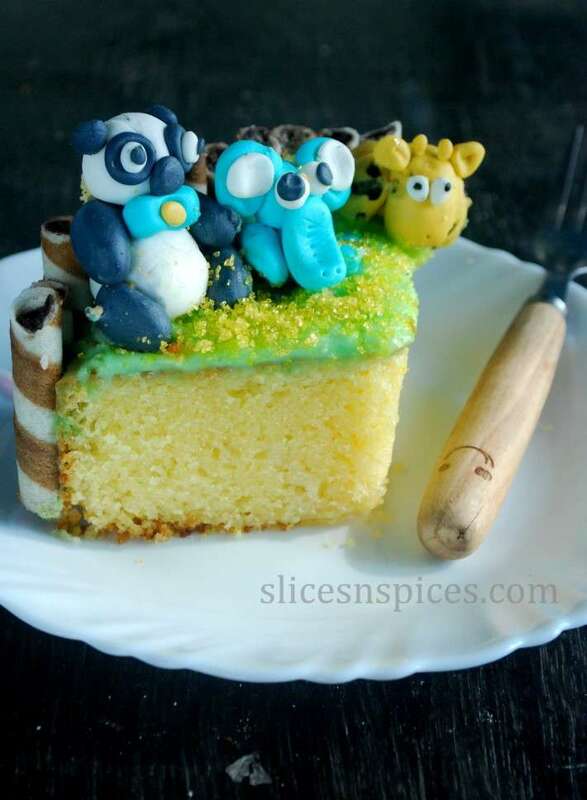 So here was a lemon sponge cake, with coloured ganache frosting, fondant animals on it- a panda, a sitting giraffe, a monkey . The snail HAD to feature here, as this small crawling creature fascinates Anuj to no end. The’ taekwondoers ‘ at home always want a celebratory cake to be cut for their belt promotion. On my to-do list is now those taekwondo figurines, and hope to be doing that before any of us become black belters. This is a chocolate fatless sponge, modified from this plain fatless sponge recipe by replacing 1 tablespoon all purpose flour with cocoa powder. Green and green 1 belts were placed on this whipped cream covered black forest cake to celebrate hubby and son’s promotion to their next belts. When the whole caking and non caking worlds are screaming minions, how can I be left behind! A mango cake, with mango fresh frosting, with melted chocolate highlights, this cake is very dear to me, as it was baked for my nephew, who stayed with us during this summer vacations. 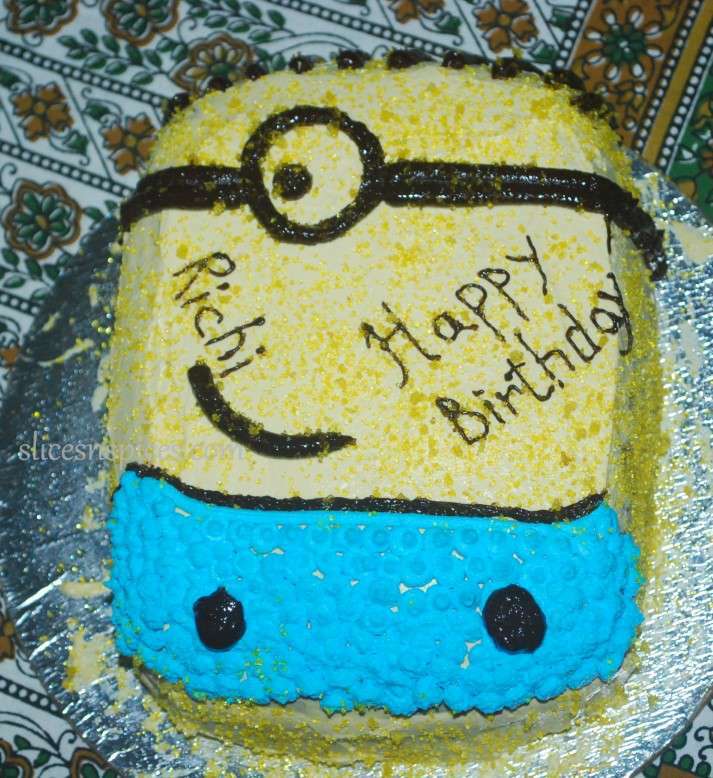 For kid’s birthdays, I always bake spare cake, just in case the cartoon/themed cake doesn’t work out as planned, then I atleast have something to display for the guests at the customary cake cutting. I call this my plan B cake. It can be a simple round or square shaped cake, with your most succesful cake flavour and simple cake decorations. 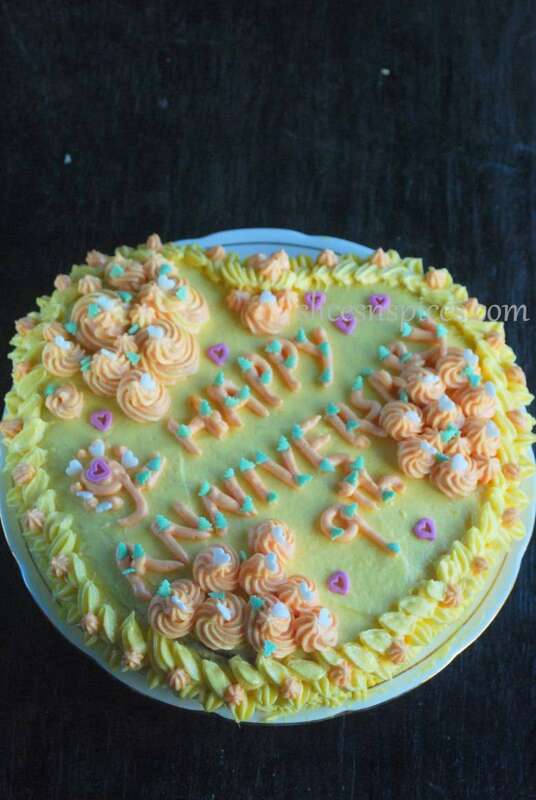 A mango cake with cooked flour mango butter cream frosting. The frosting was adapted and slightly modified from one of my favourite blogs gayatricookspot, who has a goldmine of vegan baking recipes. These days I’am distancing myself from non diary whipping creams, which come loaded with stabilisers (read dalda and similar additives). Buttercream is next best option, and with a cup of cooked flour going into this frosting, I could not only cut down on the amount of butter, but got a beautifully stabilised pipeable cream. I had a gala time piping those roses. This one was for our 9th marriage anniversary. 1. Plan plan plan- well in advance! Make a check list, keep checking and editing it. Kids get kind of weird ideas. Make sure you stick to the major part of your planning and make small changes wherever needed. 2. 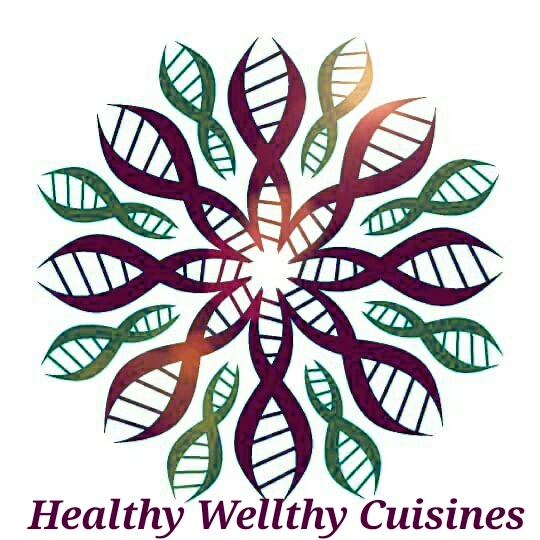 Shop well in advance, right from online ordering of pans/edible colour/ cake toppers to the local purchase of flour, sugar, butter. Its really frustrating to start baking only to find a key ingredient missing. 3. If planning to make fondant figurines, make them at least 1 week in advance, let them dry up completely under fan and store in airtight boxes. You can also make them weeks in advance. Youtube has lots and lots of tutorials on how to handle fondant, make figurines, storing them etc. 5. Always frost one day before the D-day, believe me you will sleep in peace when there is a frosted cake resting in refrigerator. On the day of the birthday, the last thing you want is to clutter your dining table or kitchen counter with all the frosting equipments. Once frosted buttercream and whipped cream cakes should be refrigerated until cake cutting. If its a butter based cake ( i.e the recipe of the sponge has butter in it ), take it out half n hour before the cake cutting ceremony. No fondant should go into the fridge. So fondant figures are best stored in airtight boxes outside, and placed on the cake only just before the cake cutting. 7. 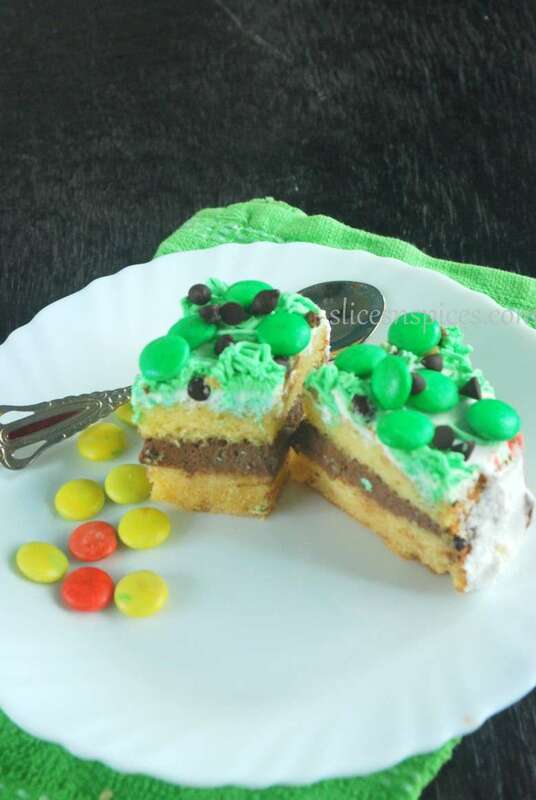 Accesorize -Gems (mnms), colourful sugar sprinkles, toffees, lozenges etc come handy to cover up any small or big patches on the cake. Remember its for kids’ birthday and no one will complain if you load the cake with chocolates instead of frosting. Colourful fruits like berries, grapes are great too. 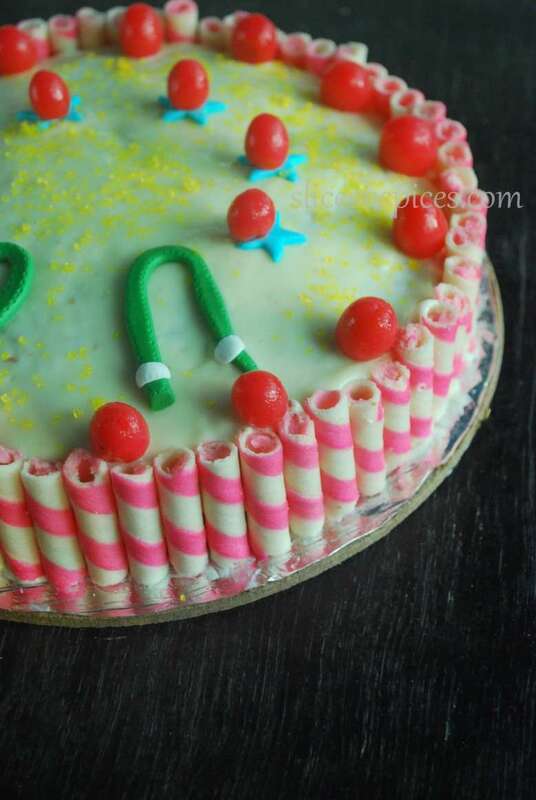 Kit-kat is best used to cover the outer circumference of the cake, like I did in this Santa Claus cake. 8. 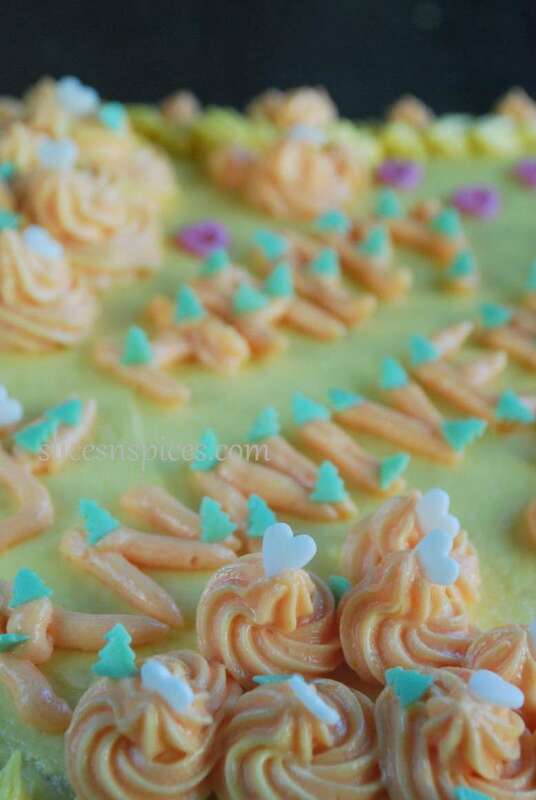 Although when it comes to frosting, there is no end to must have equipments, but with an offset spatula, a hand mixer, a piping bag and few basic shaped nozzles you are good to go! With the recent rise in adulteration of breads, pizzas, cakes and other bakes, isn’t it soul satisfying to bake one at home? I really wish you bake a celebratory cake at least once and experience the bliss of the whole process. Meanwhile I will keep editing this section as and when I bake more cakes. but most importantly , I thank all my readers, visitors, friends, family who have been a part of this beautiful experience. I wish to help all of you in whatever small ways I can, learn from your feedback, keep improving in this process. Thanks again from the bottom of my heart! PINEAPPLE UPSIDE DOWN CAKE – Welcoming Spring….